For my new years eve party, I wanted to get as many people tore up as possible, with a minimum of at-party-time prep work. I had been frequenting the Quoin in Fremont, and their main libatory accomplishment is the fact that they serve house-infused soju. Soju, for those of us who are ready, is a Korean distillate of rice (or other starchy produce) with a neutral flavor, similar to vodka. It is usually a little sweeter than vodka, and the wikipedia article is difficult to parse, but it seems like they might just be adding some sugar on the back end. The Jinro soju that I purchased clocked in at 48 proof, which is low enough to serve over ice and still give everyone a good time. I did a bit of googling and I found out that infusing fruit in soju is a traditional korean practice for preserving the flavors of fruit in the summer time. That makes this drink a bit out of season for the time I made it, but the end product was quite satisfying. As you can see, I made two different varieties for the party. On the left, cranberry, orange peel, and cinnamon combined to make a spicy, wintery potion which I finished, the day of the party, with half a cup of simple syrup. It came out a bit too sweet for my personal taste, but it was surely a hit with the ladies. The cranberry flavor was perceptible, but it was milder than I was hoping. If I did this again, I would consider pureeing the cranberries in the blender and then finely strain the infusion into a serving vessel. That might put too many bitter vegetal notes in the drink, so another option would be to concentrate the pureed cranberry’s flavor into a syrup, which I would mix into the soju a couple of days before serving. Allow the mixture to infuse for two weeks, stirring and tasting every two days. Remove the cinnamon stick after ~1 week, once the cinnamon flavor is evident but not overpowering. 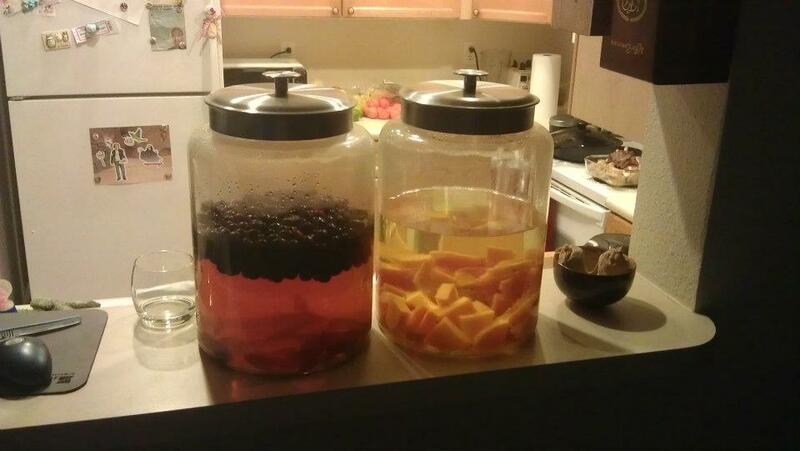 On the right is soju infused with roasted butternut squash and a single vanilla bean. Like most squashes, the butternut when roasted took on a slightly sour note, but as the vanilla flavor matured it developed a quality not entirely unlike play-doh, in a good way. I was personally much more pleased with this soju than the other, but the sweetened, familiar flavor of orange cranberry proved to be a bigger crowd-pleaser. 1 Butternut squash, roasted in the oven until soft and caramelized, cut away from the peel. 1 vanilla bean, split open. Allow the mixture to infuse for two weeks, stirring and tasting every two days. The vanilla bean can accompany the squash throughout the duration of its voyage. Categories: infusions | Tags: cranberry, infusion, soju, squash, vanilla | Permalink. Very nice! You’ve hit upon quite a few infusions that I too have done. Great post and great blog! Consider me a follower. Thanks a lot! I’ve actually done the pumpkin, vanilla, cinnamon infusion in vodka as well, though it was a couple of years ago and I didn’t take any pictures. It was a fun little project, though.